Last week I returned from the Dynamic Walking 2017 conference, where I had a poster and five minute talk on some of the numerical trajectory optimization work I’ve been doing for spring loaded inverted pendulums. More specifically, I was trying to determine what kinds of strategies the optimizer discovers when recovering from landing unexpectedly on an ice patch. This post will give a quick overview of the results but for more details please see my abstract submission and optimizer setup description. 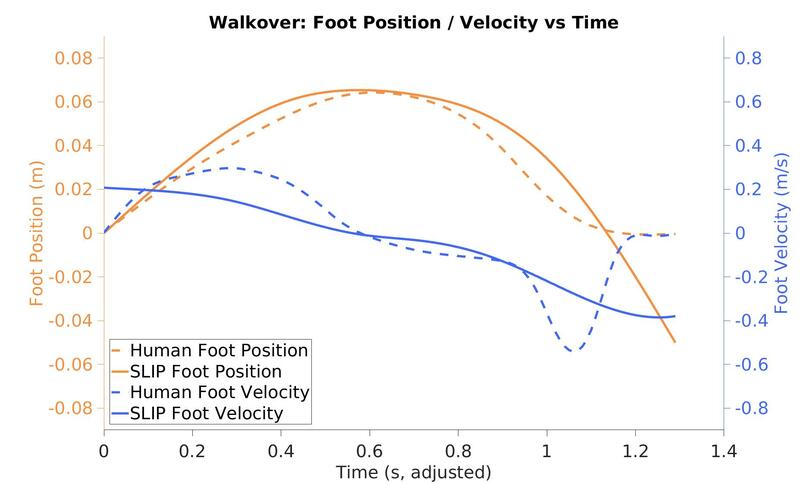 As you can see, the general arc of the foot position is matched by the optimizer but some of the nuances of the foot velocity profile are lost. 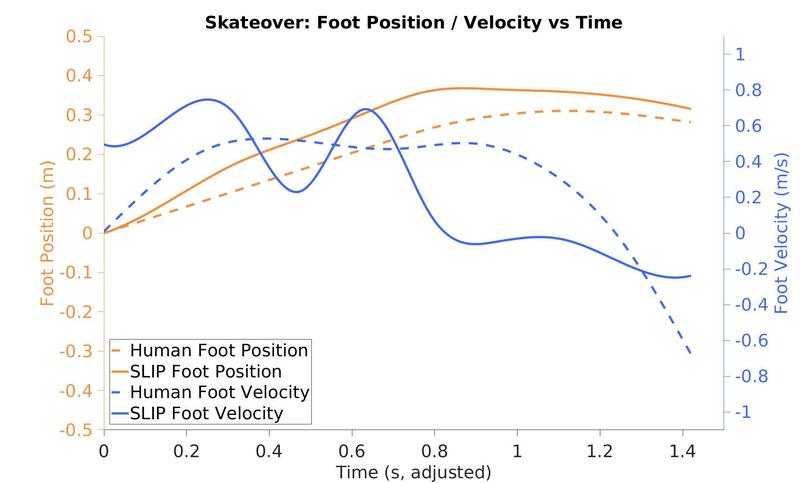 Most notably, in the walkover case humans regulate their sliding foot velocity to zero by the end of the stance phase but my optimizer did not. These differences might be attributable to some of the errors listed below. I’d like to end with a quick note about how these kinds of optimization exercises can be used to not only improve our understanding of human locomotion but also develop practical robot controllers. If we assume that the robot has some knowledge of its state and an upcoming obstacle, it could be feasible to use that information to select an appropriate traversal strategy from a library of previously-computed solutions. That rough version of the trajectory could then be used to initialize an on-board trajectory optimizer or some other method that ultimately controls the actuators. T. Bhatt, J. D. Wening, and Y. C. Pai, “Adaptive control of gait stability in reducing slip-related backward loss of balance,” Experimental Brain Research, vol. 170, no. 1, pp. 61–73, 2006.